This mesh office chair provides all round comfort and lumbar support for all office environments. Featuring height adjustable arms and a locking tilt mechanism it is suitable for everyone. Palono is an all mesh chair at a very economical price. These office chairs are held in stock for a quick delivery. 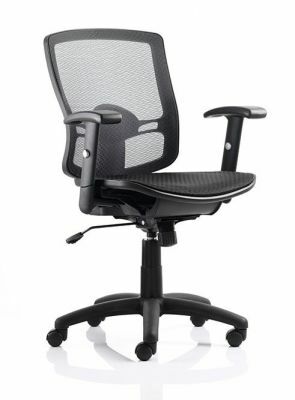 This all round mesh office chair offers good support and promotes good air circulation all around the body. The only chair with mesh seat I could find for a reasonable price. Easy to assemble, good comfortable lumbar support. Only criticism is the armrests aren't very adjustable (up/down only), and have some play (maybe 5mm in any direction).